This example shows how to generate a light-curve and save a user generated GTI file via cursor using XSELECT. For further information on filtering within XSELECT, please refer to the manual. 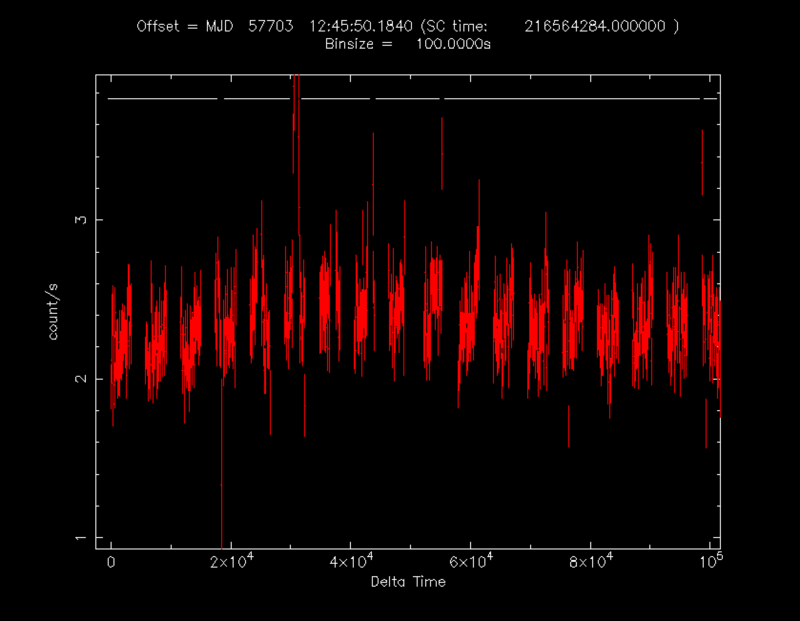 The light curve can be filtered using the "filter" command in XSELECT. Filter types include region, time, and energy channel filtering. For example, if you are interested in the background, then do not include the source in the region filter. Contrary, if you are interested only in the source, then you only include a region around the source. The region file used as input should be in DS9 format. If you do not filter on a region (or time or energy), you will get a light curve for the entire image (or the total exposure or the full energy band). For further information on filtering within XSELECT, please see the manual. In this example, we select to create a source region filtered light curve that is then filtered on time in order to remove flares due to high background. The light curve before excluding high background periods looks like Figure 1. We will select the GTIs via the cursor option. For the cursor option, you need to type "quit" into the prompt before selecting the time ranges. After making your selections in the xwindow, type "x" within the window to exit. Please refer to the instructions for other options. Note that the white bars at the top of the plot designate the good time intervals. IMPORTANT: It is critical to understand that the light curves produced by XSELECT have *NOT* been corrected for deadtime, effective area, or the PSF, so differences may be expected in rate and shape when compared to the light curves produced by the NuSTAR pipeline, which have had all these corrections applied. The light curves in XSELECT are only made to facilitate the selection of the GTI and should not be used for science. If you want to reproduce your light curve with the new GTI selections it must be done with nuproducts or nulccorr. Figure 1: Light curve of the observation 30202002004.
the selection click the second time outside the plot. We check the lightcurve using the new GTIs. 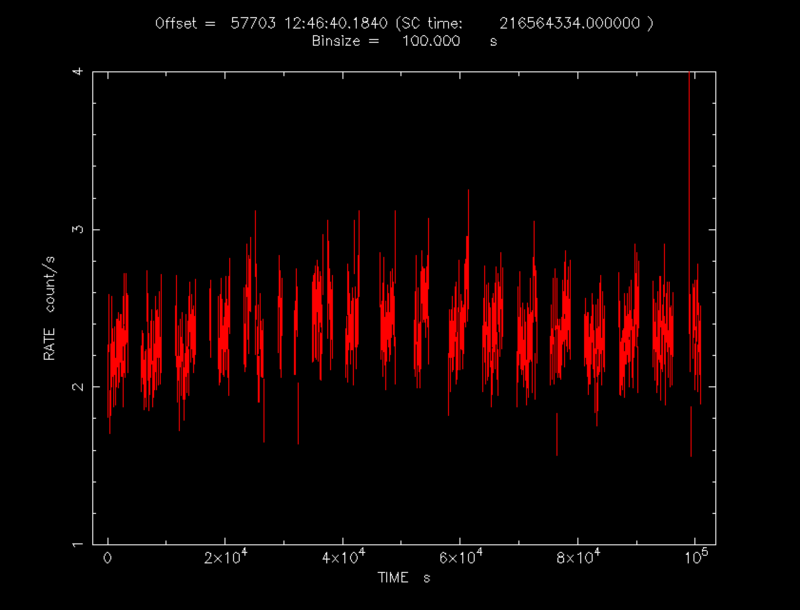 The filtered light curve looks like Figure 2. The saved GTI file "nu30202002004A01_cl.gti" can be provided as input to nuproducts using the "usergti" parameter. Figure 2: Light curve after excluding high background periods. Note: If you do multiple cursor selections, i.e. close the selection window and open it up again to do another, they all add up when you finally do save. This also means if you made a mistake you should do a "clear time cursor" first before proceeding with your new selection.